Although it represents a specific place, The Perfect Home ll nonetheless challenges the concept of site-specificity. 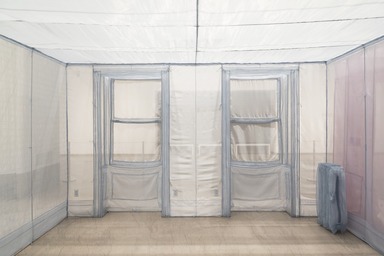 The fabric membrane is a faithful re-creation of a singular site—Suh’s apartment space, an ethereal edifice that contains memories of his life in New York. 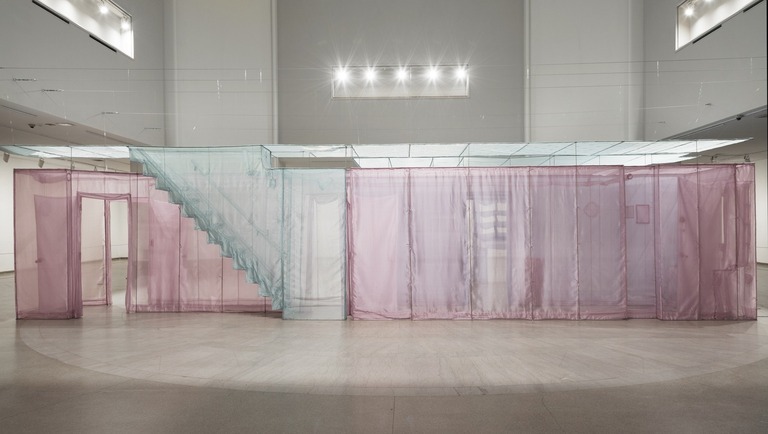 But once one of Suh’s works is removed from its original and often private context and re-sited in the space of a gallery or museum, it is displaced and assumes a new identity, shaped by the new environment around it. In the case of the Brooklyn Museum, the imposing Beaux-Arts architecture of the Cantor Rotunda, with its century of history, intermingles with the intimate domestic architecture of The Perfect Home ll. In the Museum context, The Perfect Home project, with its celebration of interior living spaces, also invites comparison with the Period Rooms installed on the 4th Floor. Suh moved into his Chelsea apartment in 1997. At that time, the neighborhood had not yet evolved into the cultural nexus it is today, with a thriving gallery scene and the High Line, the famous park built on abandoned elevated railroad tracks. Nonetheless, the process of obtaining the apartment on West Twenty-second Street entailed an interview with the landlord, who, upon learning that Suh was an artist, expressed some concern that he might not be able to pay the rent. But after he moved in, the landlord allowed Suh to do whatever he wanted in the house. That gave Suh the freedom he needed to meticulously measure the public hallways at 4 a.m.—before other residents in the building were up—in preparation for constructing The Perfect Home ll. 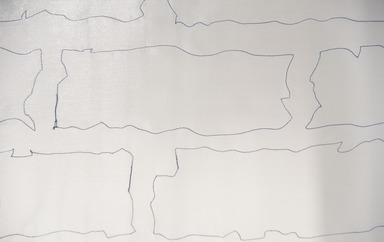 Making this piece and others like it involves precisely measuring every inch of the space; as the artist says: “You really get to know the space. . . this space becomes a part of you.” The apartment was Suh’s New York home during his formative years as an artist and as such holds a significant place in his life and memories. He left the apartment in 2016, shortly before the brownstone went on the market following the landlord’s passing. The nearly two decades Suh spent on West Twenty-second Street encapsulate a familiar New York story of neighborhood gentrification and displacement. 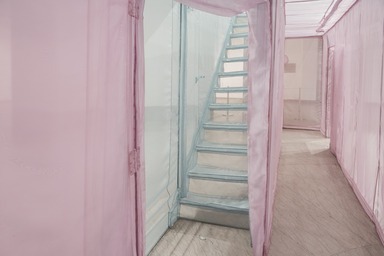 One: Do Ho Suh features a single, large-scale work by artist Do Ho Suh, whose work engages with migration and cultural displacement. 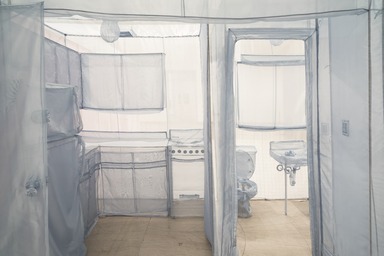 The Perfect Home II (2003), a recent acquisition in the Museum’s collection of Contemporary Art, is a full-scale re-creation of Suh’s former apartment in New York, where he lived from 1997 to 2016. 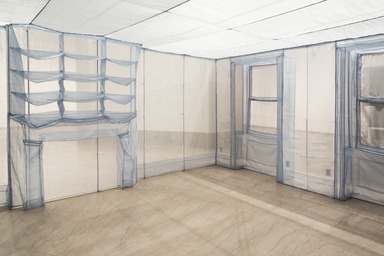 Made with a translucent nylon material and carefully hand-sewn, the work questions the meaning of permanence, the process of finding a home, and how personal space comes to define an individual—themes that are particularly resonant at a time of mass global migration. 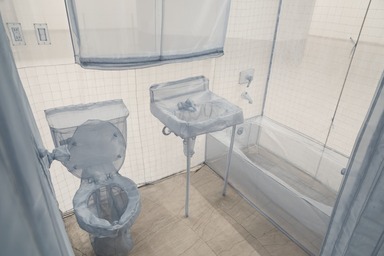 The exhibition, part of the One Brooklyn series, is curated by Eugenie Tsai, John and Barbara Vogelstein Senior Curator, Contemporary Art, Brooklyn Museum. Each exhibition in the One Brooklyn series focuses on an individual work chosen from the Brooklyn Museum’s encyclopedic collection, revealing the many stories woven into a single work of art. Do Ho Suh was born in 1962 in Seoul, South Korea, and immigrated to the United States when he was in his early twenties. His work reflects his personal history of migration and displacement, and often centers on notions of personal and cultural identity. He is best known for his meticulously crafted fabric sculptures and full-scale replicas of homes he has lived in. 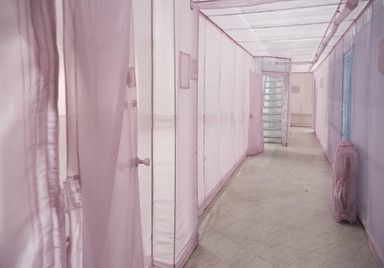 The Perfect Home II, which reproduces the apartment he lived in on West Twenty-second Street, in Chelsea, for nearly twenty years, emphasizes the connection people have to physical spaces, and how such spaces often come to embody memories of living within them. 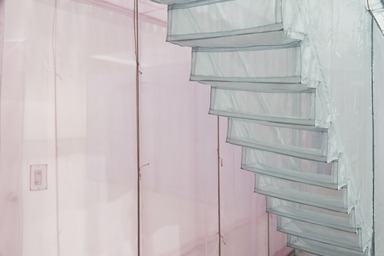 The installation re-envisions the apartment itself, rendered in blue; the adjacent corridor, in pink; and the upstairs floor, in green. 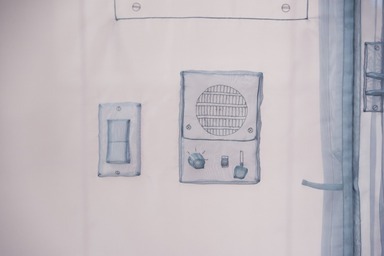 Suh spares no detail in the life-size recreation of his apartment, which includes infrastructure details such as air vents, radiators, and light fixtures, and even an intercom. Visitors are able to walk through Suh’s work, in a sense inhabiting his former apartment and his memories. 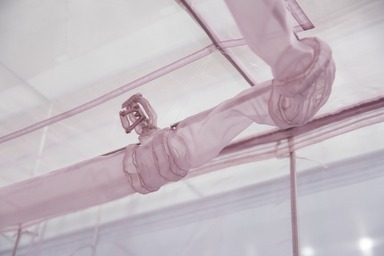 The delicate fabric chosen for the sculpture lends an ethereal quality to the work, heightening the feeling of walking through the artist’s intimate world. 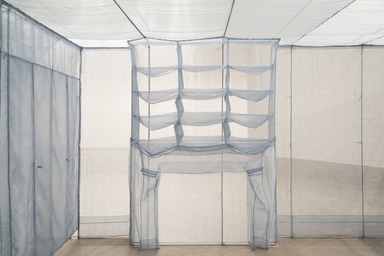 Suh’s lightweight fabric sculptures allow him, quite literally, to put his home and related memories into a suitcase to carry wherever he goes. Like many artists, he lives a nomadic existence. After moving to the United States from South Korea, he relocated to Berlin and then London, where he lives now. These moves have found the artist repeatedly adapting to a new environment in a foreign culture. 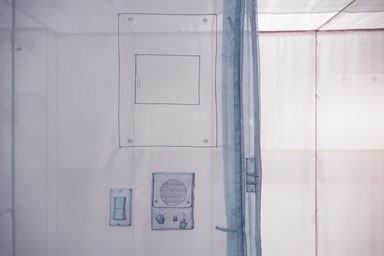 By re-creating his former homes, Suh is able to create a transitional space during these periods of adaptation—and even carry these structures and the memories they contain with him. Leadership support for this exhibition is provided by Olivia Song and Scott Rofey and Phillips.